Kalashnikov Seeds has been created by a small group of old school growers and Soviet army veterans who have been breeding cannabis seeds in Russia for more than a decade. Based in the Kuban region, close to Sochi, Kalashnikov Seeds work in constant co-operation with cultivation partners in Saint Petersburg and in the Far East region close to China. All of Kalashnikov strains are the result of cross-breeding AK-47 (Serious Seeds) clones with Russian, Dutch, Spanish, Eastern European and Afghan landraces. Kalashnikov Seeds have been breeding cannabis since 2002, were first introduced to the Russian market in 2013 and the wider European market in 2014. Within a short time, Kalashnikov Seeds became the number one home grown brand in Russia and are now actively competing with many Western seed banks on their own territory. Kalashnikov Seeds are now available in five countries including the United Kingdom, Germany, Italy, Spain and Poland. Apart from autoflowering and feminized seeds, after years of experiments, Kalashnikov Seeds have achieved an incredible line of Express strains, including AK Kush Express, Kalashnikov Express, Baikal Express, Kabul Express, and White Critical Express. These strains are characterized by shorter periods of flowering than their feminized counterparts. However, Kalashnikov’s express strains are not autoflowering. This is something absolutely unique to the international cannabis seed market and it is the reason why Kalashnikov Seeds don't specify the exact genetics of these express strains. While Dutch and Spanish seedbanks still dominate the bulk of the cannabis seeds market in Russia, Kalashnikov Seeds are intent on proving that Russian-grown seeds are as good as any seed you can buy in other, more established European countries. Kalashnikov Seeds participate in a number of Cannabis Expos, in order to spread their name around Europe and engage their customers on a personal level. They are gradually gaining popularity beyond the Russian border thanks to the beauty of many of their strains. 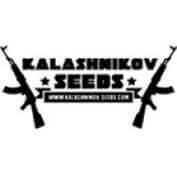 Try the best that Russia has to offer – Kalashnikov Seeds are available to buy at Seedsman now.